Very cool to see a former Bulldog come back into the fold! As the Alberni Valley Bulldogs wrap up the 2012/13 three-day main camp, the organization announces a change to the coaching staff. The Alberni Valley Bulldogs are proud to announce that Matt Korchmar will replace Perry Elderbroom of Gold In The Net as the Alberni Valley Bulldogs goalie coach. Korchmar makes his return to the Alberni Valley and to the organization. Korchmar appeared in 9 games between the pipes for the Bulldogs in 2006/07 before moving on to play for the Portage Terriers and the Fort McMurray Oil Barons. “It’s nice to be back in Port Alberni with the organization that I got my start and still be able to see some familiar faces,” said Korchmar. During Korchmar’s tenure with the Bulldogs, he billeted with current Bulldogs’ educational advisor Tom McEvay. Korchmar is entering his 8th year as a goalie coach and instructor. 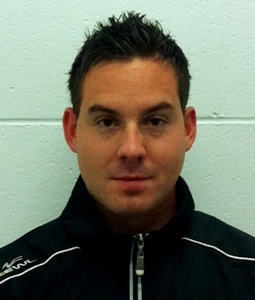 Matt has quickly established himself as one of the top goalie coaches in British Columbia. Matt has worked closely with and learned from several NHL goalie coaches. Korchmar will also instruct at the Alberni District Hockey Canada Skills Academy and will also be available for additional goalie instruction here in Port Alberni. The Alberni Valley Bulldogs would also like to thank Perry Elderbroom for the contributions he made to the organization and wish him continued success.